Featuring an indoor heated swimming pool, a fitness center and sauna facilities, Medina Grand is in the heart of Sydney. It offers air-conditioned apartments and studios with a private balcony. The spacious accommodations at Medina Grand Sydney feature modern décor, cable TV and kitchen or kitchenette facilities. All have large windows, and some offer stunning views of the city skyline. Medina Grand Sydney is a 2 minute walk from Town Hall train station, offering access to all of Sydney’s top attractions. 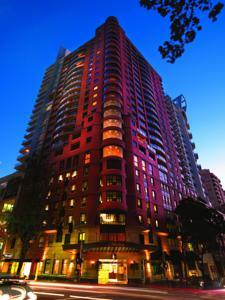 Darling Harbour and Chinatown are both within a 5 minute walk of the property. The Medina Grand is a 25 minute drive from Sydney International Airport. Rooms: Apartments: 144, Hotel Chain: Medina. Wired internet is available in the hotel rooms and costs AUD 12.50 per hour. One child under 2 years is charged AUD 5 per night in a baby beds. One older child or adult is charged AUD 50 per person per night in an extra bed. The maximum number of extra beds/baby beds in a room is 1. Any type of extra bed or crib is upon request and needs to be confirmed by management. Supplements are not calculated automatically in the total costs and will have to be paid for separately when checking out. American Express, Visa, Euro/Mastercard, Diners Club, JCB, Debit card, Eftpos The hotel reserves the right to pre-authorize credit cards prior to arrival.